such a striking image. normally I just love the use of space, but for me I feel the image would be stronger cropped closer. To me the six elements are not in harmony. two birds ok. two leaves... the bg and then the long stalk. what works for me are the birds, the two prominent leaves and a shortened stalk against the bg. a beauty of a capture with both of them are looking at each other and a well balance image, superb. lovely image of these two beauties! What a charming scene- love the symmetry of the birds and sprouts on eithe rside. So colorful! The symmetry is extraordinary, the poses are perfect, and the color is excellent. Very well done. 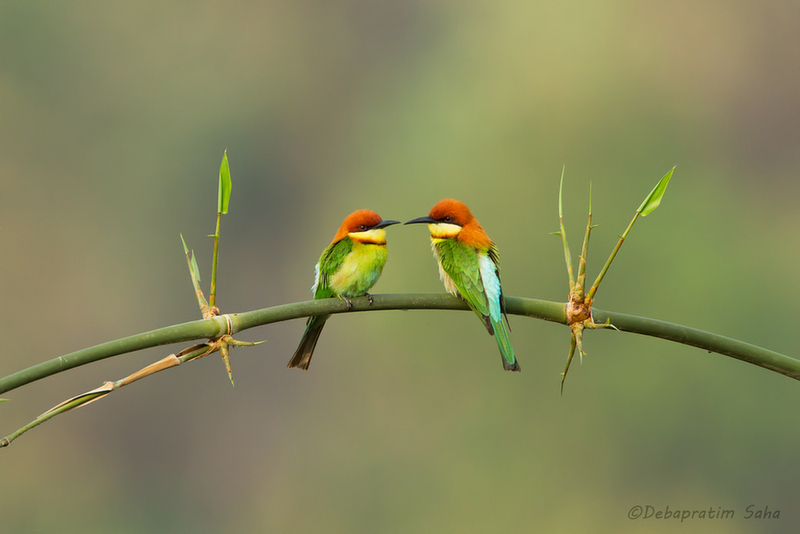 Superb shot Debapratim! Nicely framed in the center. Beautiful birds. Perfect placement and balance of all components in this wonderful frame. The light, detail and colour palette all come together so beautifully, Debapratim. Beautiful capture showing off a lovely species from front and back. Beautiful image, no wonder Arthur Morris commented on it so favorably on BPN.